School: Esc. Primaria "Juan Rulfo"
About Jose Alejandro P. H.
Jose likes to play football. In the school his favorite subject is Mathematics and his least favorite subject at school is Civic and ethical formation. He likes to go to school and he has a lot of friends. His temperament is very strong. 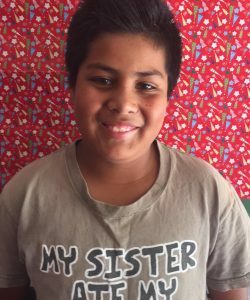 Jose helps his parents only studying; and his siblings with the homework. His favorite sport is football and his favorite cartoon is “gravity falls”. When he grows up he would like to become in an “Architect”. His dad’s name is Jose Octavio; he has an elementary school education. His health is good and he works as a bricklayer. His mom’s name is Maria; she has a secondary school education. She has a good health. She is a housewife. Jose shares his home with his parents, two grandparents, two uncles, two sisters and one brother. Their home has one living room, bath, kitchen and five bedrooms with three full beds and two singles beds. The home is their grandparents.